Pullups (and toes-to-bar) are essential. I built a pullup bar at the edge of my patio by sinking two 4x6 posts three feet into the ground, drilling holes at the top, and threading a piece of steel plumbing pipe into it. 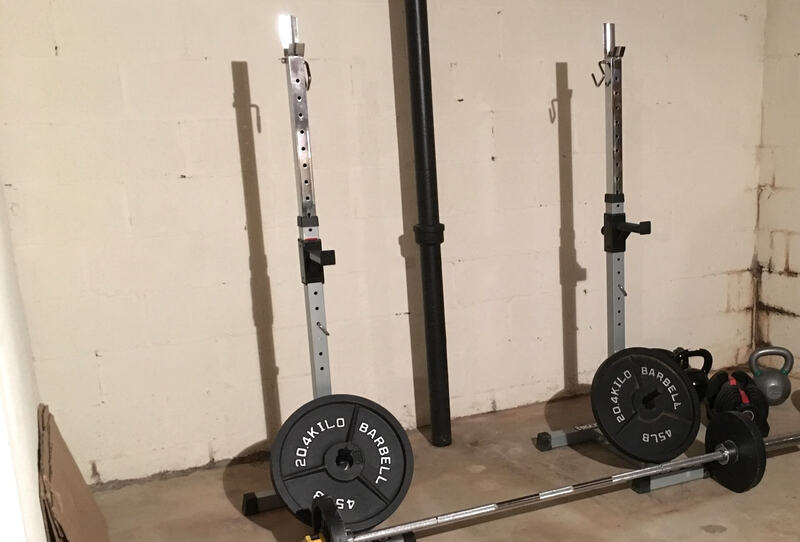 I added some heavy gate hinges as an ad-hoc squat rack, but since this is outside, I stopped using it and got an actual squat rack indoors (more on that later). I also built a pullup bar in my basement by dropping a couple of boards down from the floor joists and putting another pipe through it. I use this for my gymnastics rings too (see below). Great for wallball shots, a compound movement that combines an explosive squat with an overhead throw, working lots of muscle groups and adding significant metabolic load to make other movements more challenging. The standard medicine ball Rx is 20 pounds for men, 14 for women. 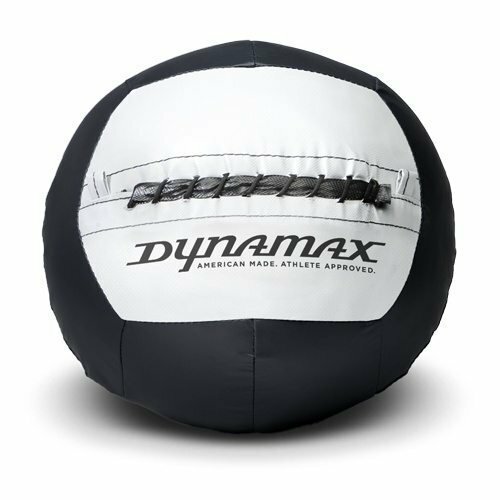 The gold standard is the Dynamax but I bought a cheaper One Fit Wonder ball I can’t find anymore. It’s harder to grip; maybe that’s a good thing. Picking a ball up, lifting it straight overhead and slamming it down as hard and fast as you can, is much more challenging than it sounds like. My slam ball is a One Fit Wonder from Fringe Sport. It’s an essential spice that I mix into other movements. The usual Rx weight is something like 30 pounds for men, 20 for women. Double-unders are my favorite metabolic challenge. There’s only a few things that spike my heart rate and breathing like double-unders. I don’t fixate on any particular rope, but this rope is fine and I’ve had it for 5 years. I never travel without bringing it along, coiled in a ziploc bag. I’ve also modified some ropes to hold heavier cable, e.g. drilling out the holes and loading in cable I bought at the hardware store. My only recommendation is to get a rope you can adjust as you learn the right size for your height. Kettlebell swings are a staple for me. You can do a lot else with kettlebells too, including Simple and Sinister, Turkish Get-Ups, one-handed kettlebell snatches and clean-and-jerks, and the like. I have a range of weights because I bought a set, but I really only use the 40-pound and heavier ones. If I were to do it again I would buy individuals, not a set. I might just buy one, the heaviest I thought I could get away with. 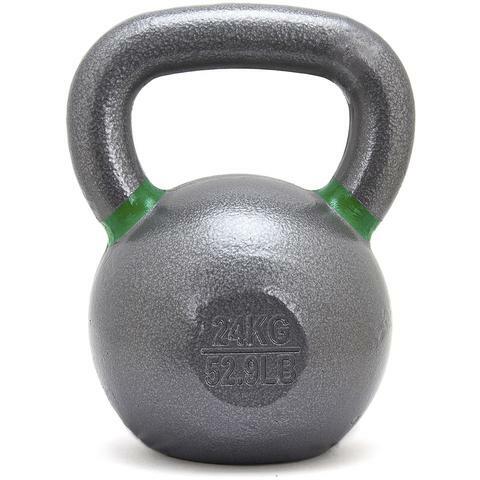 You can often find used kettlebells on Craigslist. That’s where I got some of mine. I bought others from Amazon and Fringe Sport. Rings are amazing for dips, ring rows (surprisingly effective at targeting different muscles than pullups do), and making other exercises like pushups more challenging. With rubber bands (below), they can assist with movements you might not be able to do yet. For example, if you can’t do unaided dips, just clutch a band in your grip as you grab each ring, stretching it between the rings, and place your knees on it to support some of your weight. The Titan rings I bought are one of the best fitness bargains I’ve gotten. I’ve used a lot of rings, and a bad set of rings is just the worst. But these are great: smooth, high quality, thick, with great straps and buckles—at a great price! I just loop the straps over my indoors pullup bar, and hang them on nails to keep them up and out of the way when not in use. I use dumbbells more in my home setup than I did at commercial gyms, because I often exercise outside. That means I must carry my gear through my basement out to my patio. Dumbbells are easier to carry outside than a barbell. For example, instead of doing traditional barbell thrusters, I often do dumbbell thrusters. I also use my dumbbells for farmer’s carries, weighted lunges, dumbbell snatches, and so on. This is one area I’d encourage you not to cut costs. 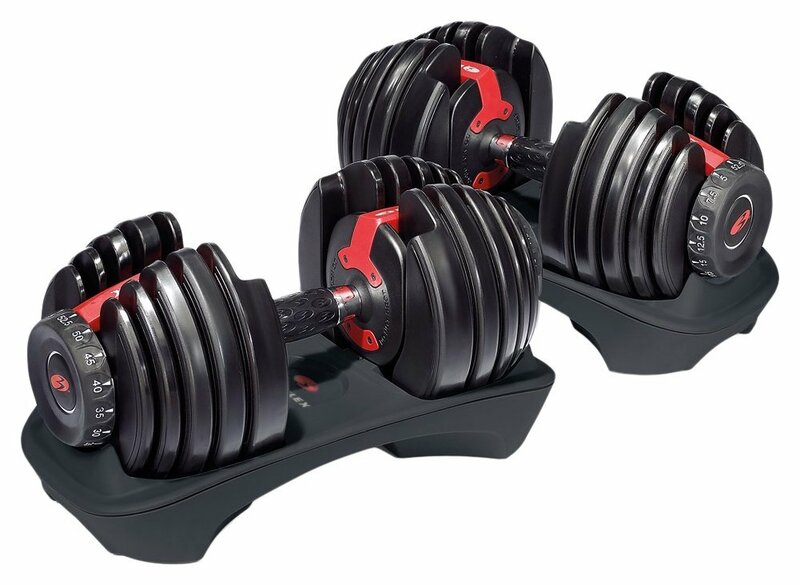 I bought an adjustable set of Bowflex dumbbells and they are awesome. 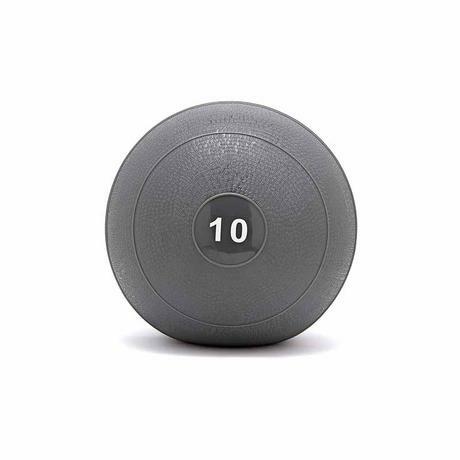 They’re easy to adjust to a variety of very specific and finely graduated weights, they’re excellent quality, and they’re a lot cheaper than buying tons of fixed-weight dumbbells. They store more compactly too. 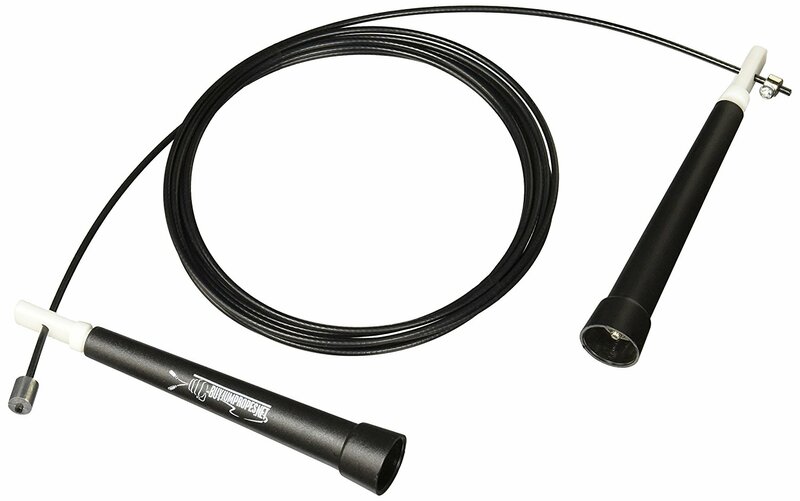 This is one of my best investments in my gear. A barbell and some weights, a rack for squats, and clamps to hold the weights in place—obligatory for me. My weights are cheap CAP barbell iron plates I got off Craigslist. I might upgrade to bumper plates at some point, but I do not throw or drop weights, even on the heaviest lifts. I lower. So iron plates work fine for me. I use some folded-up cardboard to protect the weights and the concrete floor in my basement. I bought a set that came with a cheap CAP Olympic barbell, too. It’s acceptable, and it’s a real oly bar, but not great. If/when it breaks or the bearings seize up, I’ll buy a better-quality barbell from Fringe Sport. A good barbell is such an upgrade. But mine does the job fine. I care only that I can do clean-and-jerks without struggling with a bar that is fixed and won’t spin. I also have round weight plates; 12-sided ones would not work for Olympic lifting. The clamps are one of the more important parts of my gear. I can’t stand the standard spring clamps. They get torqued and stop working right, and then you’re fighting to get them on and off (or keep them on). I bought a relatively cheap set of cinch collars from Amazon and they’re working fine. I don’t know how long they’ll last, but we’ll see. I also bought a relatively cheap squat rack. Given that I’m the only user of these, the ability to do things like change the height is not a big deal, and I’ve been able to get away without a gym-quality rack without trouble. The main caution with these is that they’re not very heavy, so they’d be easy to knock over if I didn’t keep some plates loaded on the “storage” peg at the bottom. If I needed better quality, again, I’d go to Fringe Sport without a second thought. I went to Tractor Supply Co and bought two 6x4-foot three-quarter-inch rubber horse stall mats for my patio. This is a much better surface to work out on than bare concrete. It cushions for rope jumping and other high-impact exercises (and is a lot easier on the knee if I misjudge a lunge and touch too hard), and it prevents the jump rope from fraying, breaking, and becoming dangerous. 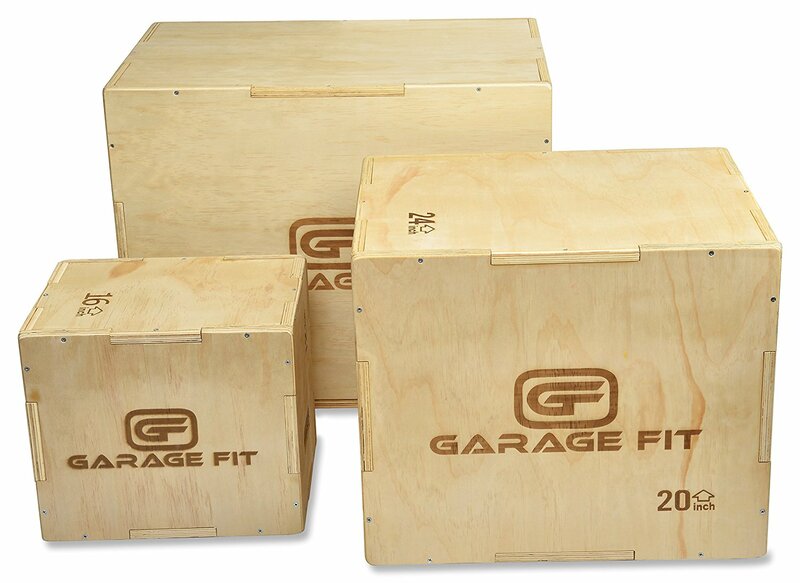 A plyo box is good for box jumps, box squats, scaled pushups, and lots of other things. I bought a 3-in-1 kit from Amazon, and I’ve been very happy with it. It was easy to assemble. (Note that the image is misleading: it shows 3 boxes in different sizes, whereas you buy one box with 3 different lengths of sides, and you can choose what size that box is—small, medium, large; Rx for men is box jumps up to 30 inches for most workouts). 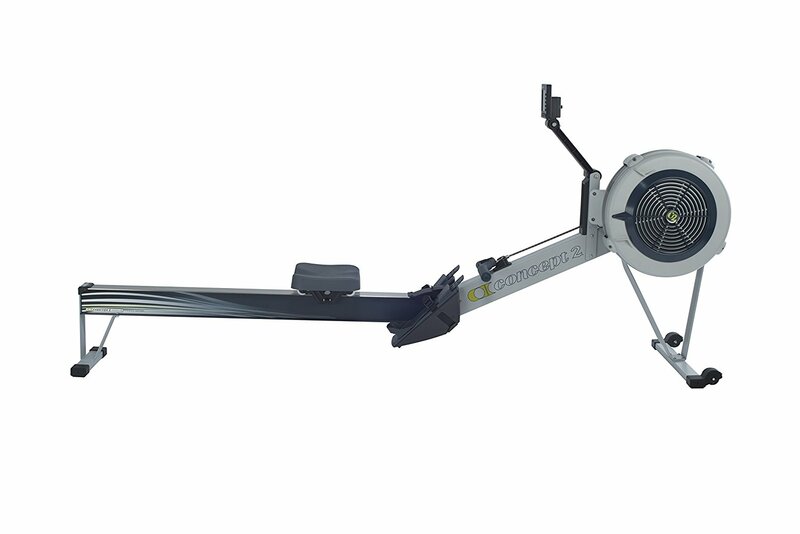 The rower is one of the only machines you’ll find at a CrossFit gym, and it’s a staple. The standard is the Concept 2 rower. I’ve never been at a CrossFit gym that didn’t use this machine. I bought one from Craigslist. It was a much older one that needed parts and reconditioning, and I didn’t give it the attention it needed, but it still worked fine. For various reasons it ended up getting sold and I haven’t bought another. I miss it. I don’t want to go back to the days before I knew how to foam-roll. These are amazing for mobilizing stubborn spots in muscles and working out soreness. The usual standard item is an OPTP 36-inch round roller, but I like the OPTP Axis better; it has a better firmness. Amazon Basics sells their own brand now! I bet the margin on these is really lucrative. After a while I discovered something even better for harder-to-reach spots. The standard CrossFit way to do that is with a lacrosse ball, but I’ve found it’s easier to get bruises and inflamed tendons with a lacrosse ball than it is to mobilize stuck tissues. They’re too heavy and hard, whereas tennis balls are too weak. But, this Pro-Tec Orb works wonders. It’s about the size of a melon and it’s just the right firmness. I often carry resistance bands with me when traveling too. They’re great for working out hard without weights when bodyweight isn’t ideal for targeting a muscle group such as gluteus medius. There’s some standard CrossFit equipment that I never bought and I don’t know that I ever will. The curved “ab mat” for situps, for example, never did much for me. On the other hand, a lot of CrossFit boxes don’t have yoga mats, and I wouldn’t be without one.